Cheltenham Poetry Festival, 25 Apr – 4 May, various venues, Cheltenham, Glos. 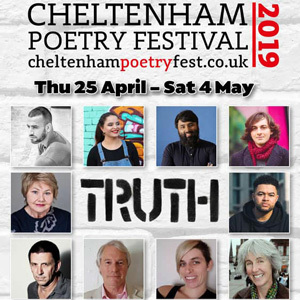 We are very proud to support the 9th Cheltenham Poetry Festival which returns bigger and bolder than ever before with the exciting, timely theme of ‘Truth’. You can expect diversity, excitement, inspiration, enlightenment, and a few surprises along the way.